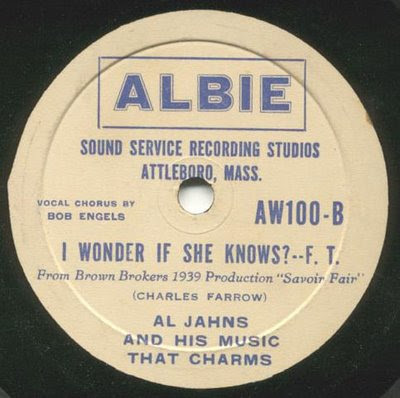 I think I'll start with something from my back yard...an obscure 78 recorded in 1939 on the Albie label, from that beehive of recording activity, Attleboro! 1939; Attleboro, MA: Al Jahns and orchestra, unknown personnel. Bob Engels, vocal. A pair of pleasant period pop songs, by a society-styled band that sounds like a cross between those of Freddy Martin and Eddy Duchin, with a hint of Lombardo. It's a bit sweeter than most of the music I collect, but there's a rather nice trumpet solo on There Must Be More To Love. Sadly, I know almost nothing about this band...but I do know that Al Jahns was a regular bandleader in Las Vegas by the 1950s. I can't find anything about either the Brown Brokers or their production Savoir Faire, either. 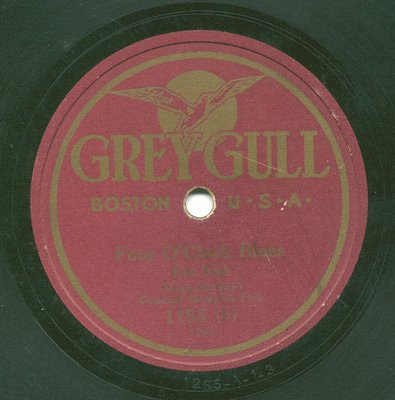 Also from 1939 (it must have been a big year for small Massachusetts labels!) 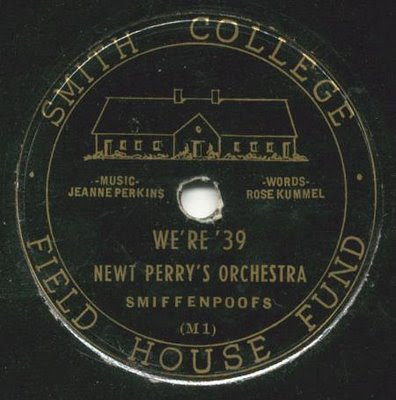 is this special record of the Smiffenpoofs, apparently issued as a fundraiser for the Smith College Field House. Label note: The typeface of the song title and artist credit looks like that of Brunswick of around that time...but the pressing and quality of recording certainly don't look (or sound) like any Brunswick product I've ever seen. There's a 3/4" section of dead wax around the edge (about three times what it should be), We're '39 ends with a locked groove (meaning there's no outgoing spiral). And it sounds like the recording engineer also just missed the beginning of the first note of We're '39. I wonder if the engineer was Wally (~ly) Ballou, before he got into radio announcing. And the volume level fluctuates quite a bit at first too. There's a line in that song that mentions the horrible hurricane of the previous year...they say it was a masculine invention and they weren't to blame. Cute! 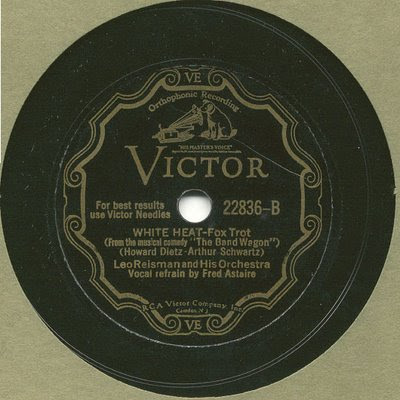 1939: Newt Perry Orchestra. Jeanne Perkins and Betty Hutchinson, vocal. I googled "Newt Perry Orchestra" and came up with a few mentions of his orchestra. Apparently they were based at Yale, but known to appear at several other New England colleges. I have yet to find any connection between this Newt Perry and the identically-named famous swim coach and founder of the Weeki Wachee Springs Attraction. The next record was found by a friend...it was sitting on top of a pile of trash in Somerville! I must thank Lola Gee for rescuing this important bit of Boston broadcasting history. It's not an especially scarce one, but it is important. It's by Rex Trailer, the legendary host of one of my favorite shows as a kid in the early 1960s, WBZ-TV's Boomtown! 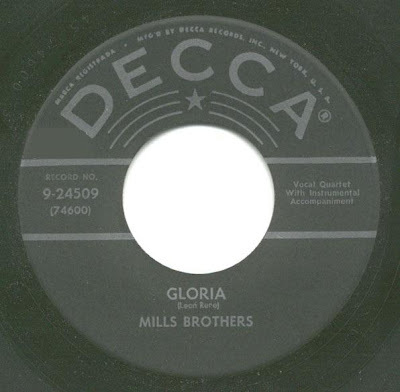 (1956-74). The show would usually open with Rex and his sidekick (Pablo in the years that I was a regular watcher) doing some sort of business in the bunkhouse before saddling up and riding to join the posse of kids gathered in the studio corral (using stock footage of Rex riding his horse Goldrush. 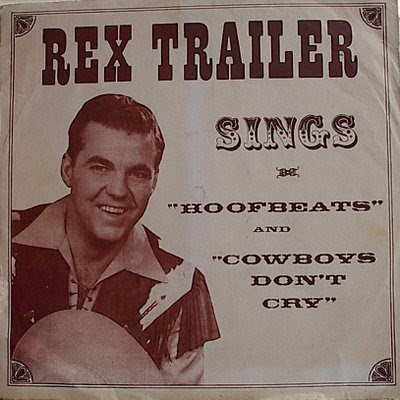 The music behind the horseback segue was Rex's 1955 single, Hoofbeats. And here it is! And its flip side too! And there's a cool picture sleeve as well! 1955: Rex Trailer, vocal; Sid Feller Orchestra. Rex celebrates his 80th birthday sometime in the coming year...here's wishing him many more! 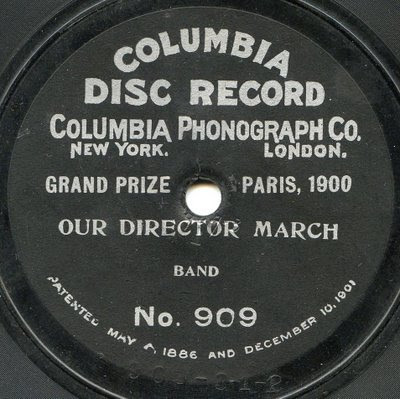 About that 78-L posting I mentioned at the top...a couple of weeks ago, the Folks were talking about an unusual record by Robert McBride that appeared on both Liberty Music Shops (a New York specialty label) and Bissell-Weisert (another one in Chicago). It also showed up on a special Musicraft pressing, sold through Briggs & Briggs, a music shop in Cambridge, MA...a block or two from Harvard Square. I remember visiting that shop a few times in the 1970s...apparently there's an Adidas store at the location nowadays. July/Aug 1939: Robert McBride, English Horn, Fern Sherman, harpsichord; Bert Shefter, piano. It's a cute record, but certainly not the hottest thing on my shelves. Aside from composing scores for a few cult films in the 1950s and 1960s, Bert Shefter is best known for a few quirky sides he did with an octet on Victor in 1936. 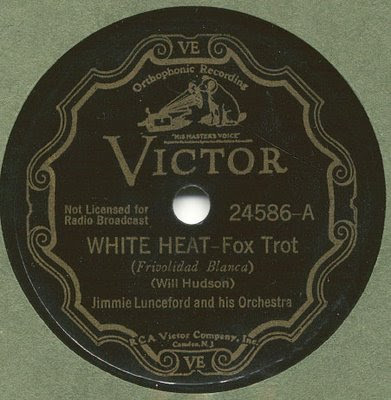 He also recorded a couple of sides in 1938 for Brunswick. I have the Brunswick, a Victor or two, and an interesting aircheck by his group that I hope to post some time soon. Since I'm on Massachusetts Avenue in the People's Republic of Cambridge, I think I'll go a few doors down and visit an old friend I haven't seen in quite a few years...actually I knew his sister better. She and I often went to record shows in Boston and rPovidence (intentional typo...seen 20 years ago in the local Yellow Pages). Here's a record on the Margosian's label...it's pretty badly chewed up, but I still like it. This side's label is somewhat legible...at least in the right light. early 1920s: V. Margosian, vocal; D. Perperian, clarinet; B. Boghosian, kanon; H. Karagosian, dumback. The flip side has a badly scratched label and the title is completely obliterated. The description "Dance Music'' is (barely) legible, as are the names of the musicians. There's also a nasty needle run that thunks through half of the song. early 1920s: same personnel, but no vocal. 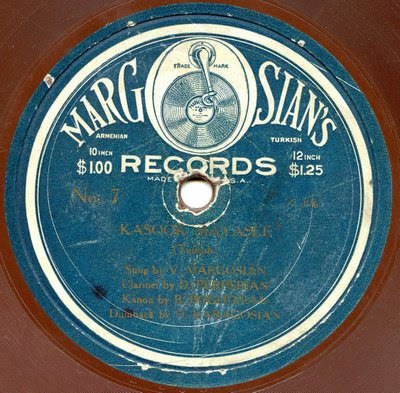 The second Armenian-American record is on the M. G. Parsekian label, which supplied music to Armenian, Greek and Turkish communities. 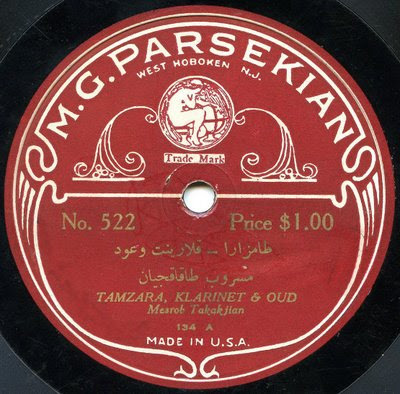 We can assume that the sides on my record were meant for the Turkish-American trade, since most of the label information is in Arabic script (Turkey adopted a modified Latin alphabet a few years later, in 1928). Unfortunately, I can't read it. Anyhoooo....I've identified each side with whatever is on the label in Latin letters. early 1920s: Mesrob Takajian, clarinet; possibly Maksoud Sariyan, vocal. Both sides have the name Mesrob Takakjian on the label...I know he was a clarinetist. Tamzara is a popular dance from western Armenia. 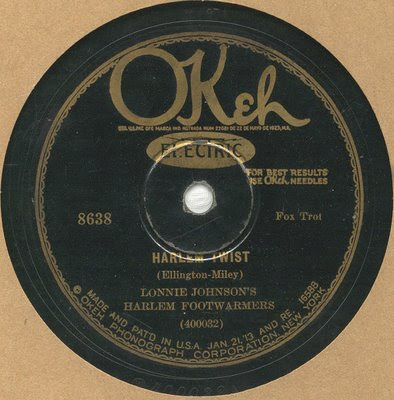 I Googled the phrase "Enishte Kantosi" (I'm guessing that "Kantosi" indicates a vocal)...and spotted (in an auction list) what appears to be an issue of the same two songs on the Pharos label. Takakjian is credited, but so is Maksoud Sariyan. Maybe he's the vocalist. Maybe he also played the oud. What interested me most was the similarity between the Margosian Dance Music side and the Tamzara side on this record...the melodies are almost the same. Anybody out there in Cyberland who knows more than I do about the title of our mystery song(s) or the musicians involved (and I don't know much at all) is welcome to post a comment! It would be most appreciated. 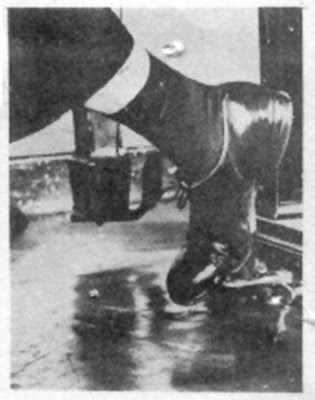 Los Angeles, January 1929: A. Kevorkian, vocal; Mesrob Takakjian Orchestra. 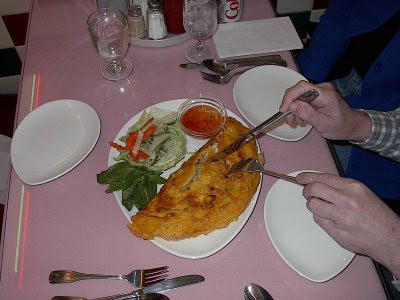 We started in Attleboro...and finish in North Attleboro. The traditional song for the North Attleboro High School is the trio from Our Director March by Bigelow. I don't believe it...Three posts since the middle of October? It never rains, but it pours, eh? 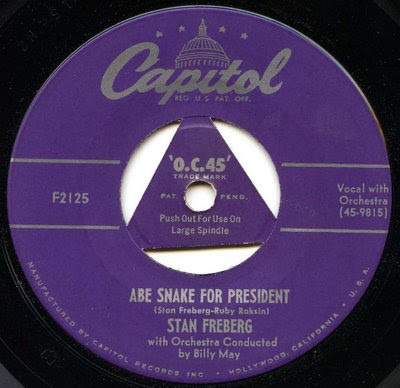 Of all of Stan Freberg's regular issues on Capitol, 1952's Abe Snake For President seems to be the hardest one to find...I know it took me a good fifteen years to snag a copy. Hollywood, March 1952: Stan Freberg, vocal; Billy May Orchestra. "He never was a general and he never sold a hat" are obvious references to Eisenhower and Truman. The line "The piano's got to go" is another light dig at the incumbent. This was the first session that Freberg teamed up with Billy May, who supplied the music for Stan's later rock 'n' roll parodies and his extravaganzas (The USA albums, especially). 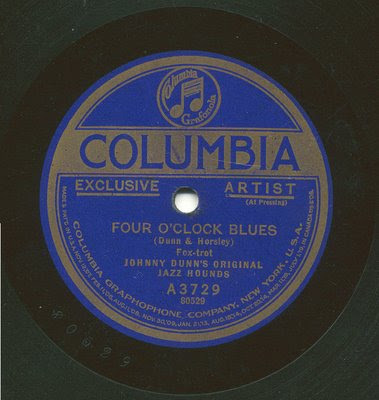 Record collectors, note that the OC 45 (Optional Center) is still attached. 95% of the time, the original owners of Capitol 45s popped them out and threw them away. A while back, the 78-L folks were talking a lot about Johnny Standley's It's In The Book monologue, the retelling of Little Bo-Peep in tent-show revival fashion, culminating in a rousing version of Grandma's Lye Soap. That record sold like the proverbial hotcakes in 1952. Standley did a follow-up record, a take off on Rock-a-Bye Baby called Proud New Father. It sold moderately well, but not like Book did. 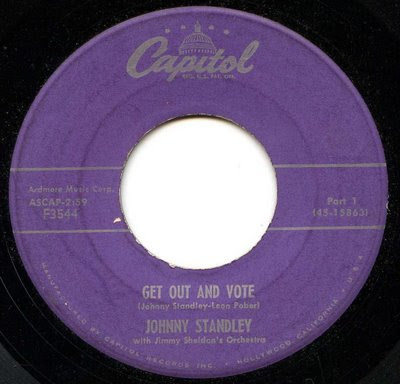 Finally in 1956, Standley did another two-sider called Get Out And Vote. It's a gently amusing sendup of politics in general. 1956: Johnny Standley, vocal and monologue, Jimmy Sheldon Orchestra. Side One originally ended with a badly spliced-in round of applause borrowed from the end of the second side. I took the liberty of performing a "clapectomy," and restored the integrity of the performance. Or something like that...I think it works better like this, anyway. 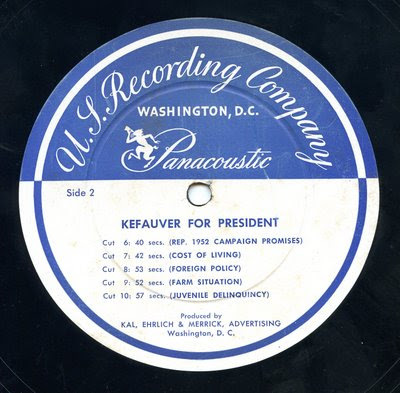 I found these two records together around 15 years ago...The first (a 12" 33) contains ten little radio spots for the C. Estes Kefauver presidential campaign of 1956. It's interesting that many of the same issues mentioned here are still relevant. And "delinquency" is misspelled on the label. Of course, Adlai Stevenson got the Democratic nomination that year, but Kefauver was tapped for his running mate. But I'm not positive when this record was made...it's obviously a jingle performed by the other "other" Ray Charles (born Charles Raymond Offenberg) and his singers. But when was this recorded? Was this record made for his senatorial campaign (the lyrics seem to say that Estes would be great for Tennessee)? 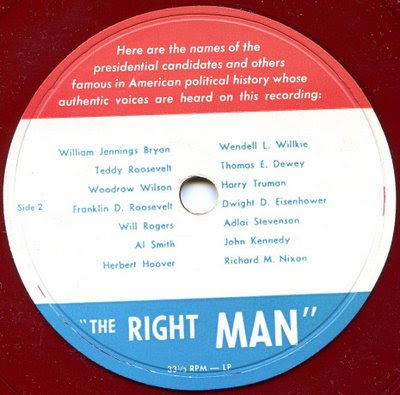 Since the fate of the country isn't mentioned, I doubt that this record would be for a Presidential campaign...besides, by 1956, most, if not all, promo singles were pressed as 45 rpm discs. My guess is that this record dates from his 1954 Senatorial campaign. 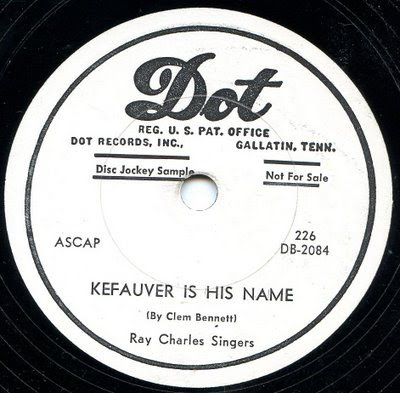 One can guess that Kefauver's people deliberately chose Tennessee's biggest label at the time (Dot Records was based in Gallatin) for distribution. They paid for the Ray Charles Singers, but no band. Just a pianist. 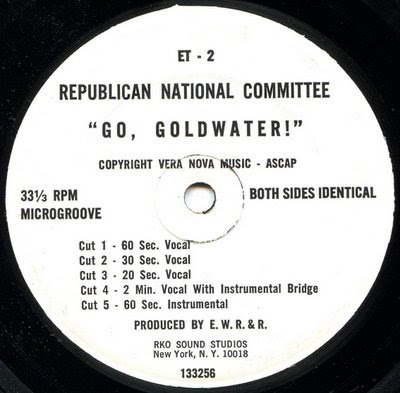 Here are some more radio spots...apparently from Barry Goldwater's 1964 campaign. As I said before, these are probably for the 1964 campaign...the presence of a Zip code indicates that it's no earlier than that. But we skipped the 1960 campaign, didn't we? I saved it for last. 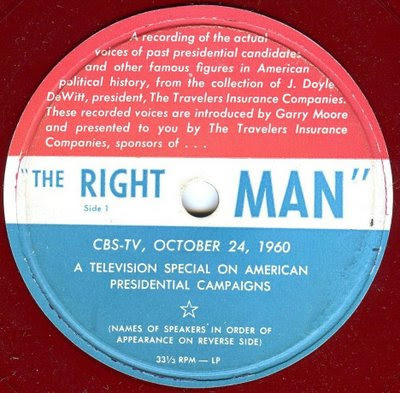 Here's a curious record (7-inch, red vinyl), featuring recorded highlights of campaigns of the past...evidently issued in conjunction with CBS-TV's production The Right Man. Garry Moore introduces the whole thing...the other emcee is probably J. Doyle DeWitt, the owner of this collection of voices of 14 celebrities/candidates. The last two were those of the 1960 campaign, JFK and Nixon. As we know, JFK won the election...here are a couple of records connected to his campaign. The first of these records has always been a little mystery to me. John Redmond is probably best remembered for being co-composer (lyricist) of I Let a Song Go Out of My Heart (with Duke Ellington and Harry Nemo...Duke's agent and publisher Irving Mills got his name listed as well). Anyway. 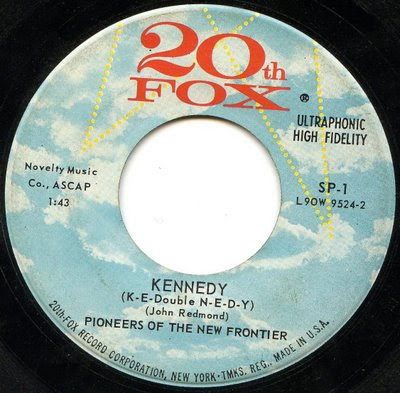 it seems that Redmond wrote Kennedy for the campaign, but it's not quite clear who the Pioneers of the New Frontier were. In any case, the 20th Century Fox label pressed it (Note...the label was called "20th Fox" until 1963, when the word "Century" was finally added.). I wonder how many copies of this record were pressed (I've never seen another copy). It's numbered SP-1...my guess that SP stood for Special Purpose or something like that. 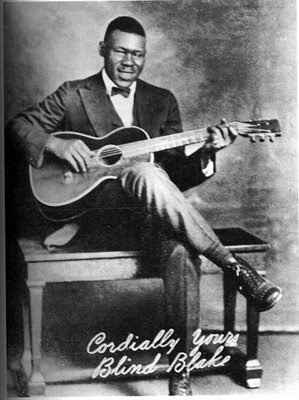 There's a nice paragraph on Redmond here http://www.jazzhistorydatabase.com/blog-chet/?p=31 , although it says that his song Massachusetts, My Home State had never been recorded. It was...it's on the flip side of this. Oh, what the heck...here it is! Aha! 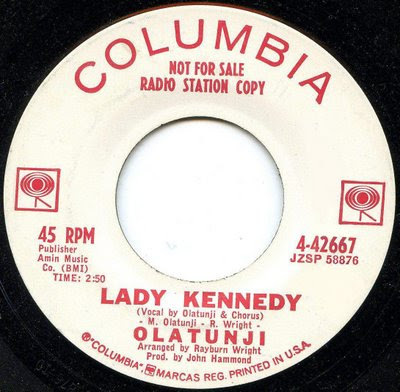 Not only was the song recorded, the melody was recycled for Kennedy (or was it the other way around?)! 24 APRIL 2013 UPDATES: Mary (the grandneice of John Redmond) wrote in to say she heard John's voice on the Kennedy side. Ron mentioned that Fox did issue Massachusetts commercially (with Tony Spumoni The Ice Cream Man on the flip side. 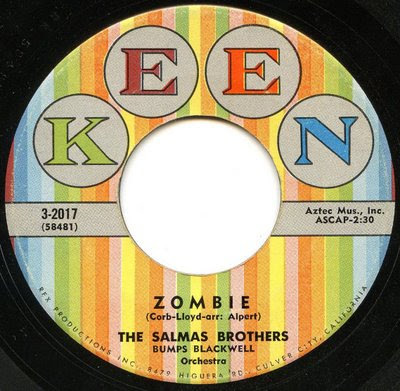 The next record is fairly common up here in Massachusetts, probably given to Kennedy supporters...I've been told that this side was played on area jukeboxes as well. Those are Sammy Cahn's special lyrics...sung by a formerly skinny kid from Hoboken. The flip side is kind of cute too, but Ol' Blue Eyes has stepped out. That's enough of the campaign songs. 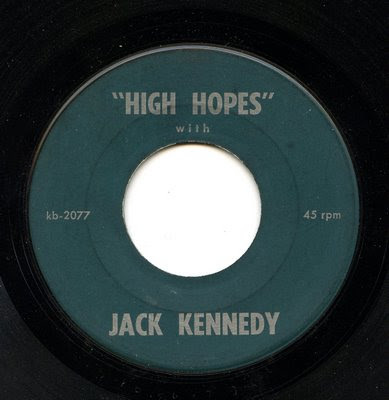 I realized I had a couple of other JFK-related 45s. Now would be a good time to share them...it's been 45 years since that fateful day in Dallas. Record collectors need no reminder about just how popular the young president was in the early 1960s...we're always running into Vaughn Meader's First Family LP and the Premier Records memorial album, each of which at one time held the record for being the fastest-selling LP of all time. In 1962, Sinatra's label, Reprise, issued an odd LP featuring Hank Levine's chorus and orchestra called Sing Along With JFK. It consisted of sampled bits of JFK's speeches, followed by the chorus singing the words. The question is...is this record serious? Or just a bit tongue-in-cheek? Or blatantly sarcastic and satirical? I'll leave the verdict up to you. More of the LP is here: blog.wfmu.org/freeform/2005/10/sing_along_with.html Is Hank Levine the Henry Levine that hosted the Chamber Music Society of Lower Basin Street radio program in the 1940s? I suspect that it is. I heard that this song was premiered at a Democratic fundraiser, but I'm not quite sure. And, as a postscript, I'll add this...2008 marks the 40th anniversary of RFK's assassination. 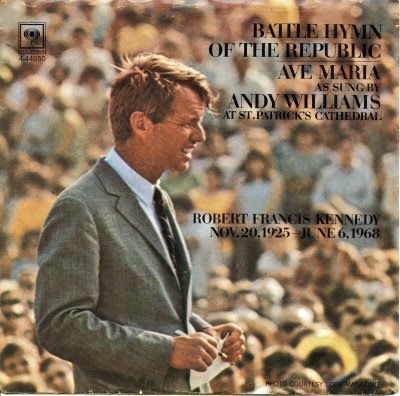 Andy Williams sang (with the St. Charles Borromeo Choir) at his friend's funeral. 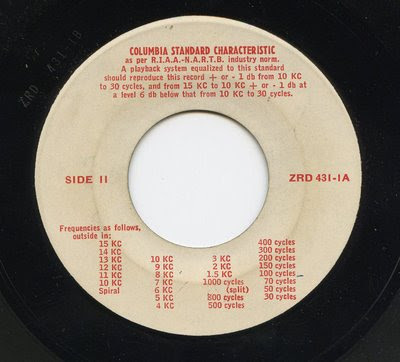 Columbia issued this 45. Apparently, it never was reissued in an LP. I'm working on a big post which should be up around November 1. In the meantime, here are a few quick Hallowe'en singles to keep your ears happy. 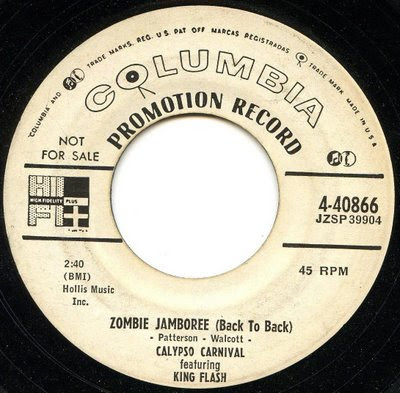 Two recorded versions Zombie Jamboree sold fairly well in the mid-1950s, one by Harry Belafonte for RCA Victor and this one, by Calypso Carnival (featuring King Flash), for Columbia. 1956: Calypso Carnival with King Flash, combo. I like this version a lot more than the other one...the LP it came from (Calypso Carnival) is a lot of fun as well. There is also a picture sleeve to this 45, but I don't have it. And, for what it's worth, the flip side of this record, Mama Looka Boo Boo, also inspired a Belafonte cover. You might remember bandleader Bumps Blackwell from those Specialty sides by Little Richard. And the arranger on this side is a cat who made a big splash in the pop market a few years later, Herb Alpert. The IFC designation is borrowed from the Greater Cambridge Record Collectors' Guild (you know who you are), who also use IMC (Insipid Male Chorus) and IXC (Insipid Mixed Chorus) to indicate the presence of this kind of vocal group, who oooh and aaaah and almost spoil hundreds of otherwise fine R & B and Rock 'n' Roll 45s from around 1956 to the Brtish Invasion. 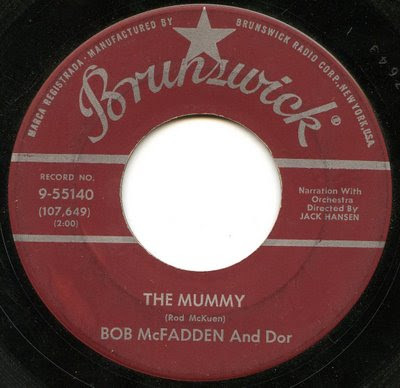 Another fair seller (it hit #39 on the charts) is this version of The Mummy by veteran cartoon voiceman Bob McFadden. The beatnik at the end of the record is Dor, a not-too-subtle alias for composer (and future "deep" poet) Rod McKuen. 1959: Bob McFadden, mummy; Dor (Rod McKuen), beatnik; Jack Hansen Orch. 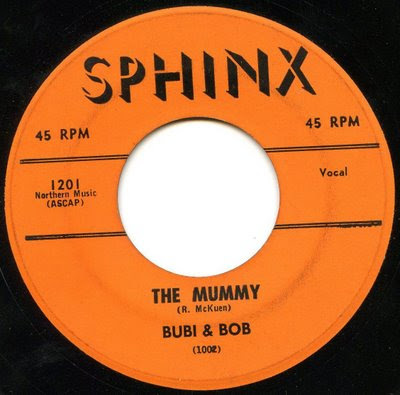 Strangely enough, there was another version of this piece (I almost called it a "song" but nobody sings) that was issued shortly afterward, by the completely unknown duo, Bubi and Bob. I know nothing about this version...who the performers are and who pressed this record will probably always remain a mystery. I've never seen another record on this Sphinx label. 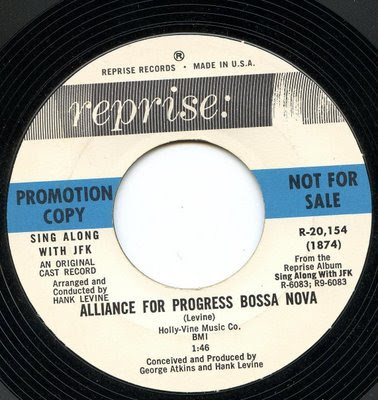 This record is somewhat better than the hundreds of cheap knockoff versions of pop songs, which were nothing new (the Tops, Prom, and Hit labels specialized in them)...there is a pleasant instrumental on the flip side (Biscayne Beat, http://www.box.net/shared/7b26xuybrr if you want to hear it) that appears to be an original. The composer of that ditty is one L. Norman...perhaps he was Bubi or Bob. And there you have it, friends...four little examples of candy corn (and a couple of parenthetical marshmallows). I hope this'll holdja until I get the November post up. I think it'll be worth the wait. Jo Stafford, CSL, and a whole lot more! I'm finally getting this posting out...it certainly took long enough, didn't it? (http://www.nysun.com/obituaries/jo-stafford-90-singer-of-swing-standards/82157/ is probably the best one) that there's little that I can add. I've always been fond of the records that Jo and her husband Paul Weston recorded under the name of Jonathan and Darlene Edwards...their impression of a truly awful lounge act. "Jonathan" would play the piano in the worst possible manner... hitting wrong notes everywhere and losing (or adding) a beat here and there. "Darlene" would sing a quarter-tone sharp. 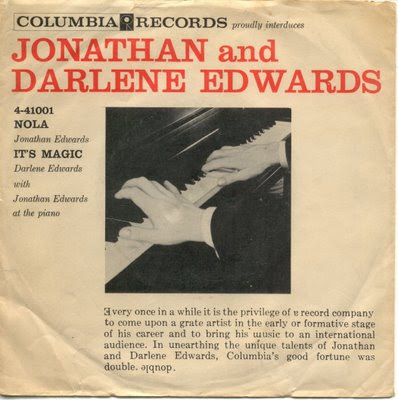 I knew that a 45 rpm single was issued from their first Columbia LP, 1957's The Piano Artistry of Jonathan Edwards...but I didn't know that there was also a special promotional picture sleeve that went along with it. A very special promotional picture sleeve. I got my copy fairly recently on eBay for a couple of bucks plus postage. Marvelous, isn't it? Jonathan's piano artistry is particularly good here...the fingers on his two right hands (check the pic sleeve!) are certainly nimble. I've never seen this pic anywhere else...it's not on the LP. In the mid 1950s, there were many (far too many, actually) cover versions of rhythm 'n' blues hits, taking the rough edges off of great R & B songs, perhaps sanitizing the lyrics a bit, and having someone like of Pat Boone or Gale Storm record them for the white pop market. Sadly, many sold better than the original records. Hollywood, 4 February 1955: Jo Stafford, vocal; Paul Weston Orch. Yep...that's a completely retooled and retitled version of Ray Charles's I Got A Woman. Don't blame Jo...she was probably forced to do it by the head of Columbia's pop division at the time, Mitch Miller (I'm thankful Mitch didn't use Stan Freeman's harpsichord this time around.) 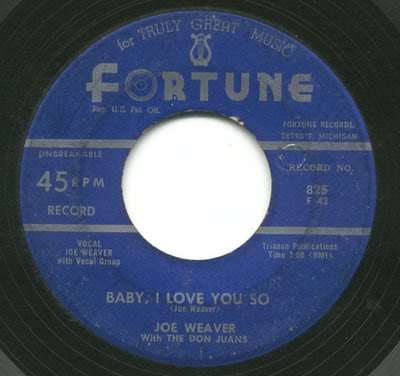 Actually, Jo sings it fairly well, but nobody can make lyrics like "he's my dreamboat" sound anything but ludicrous. Notice that the only composer credit is Ray Charles...perhaps the dreamboater decided to remain anonymous. Paging Alan Smithee! Oh, did you happen to notice the CSL notation at the 4:00 position on the label? I've seen it on many Columbia promos of the period. 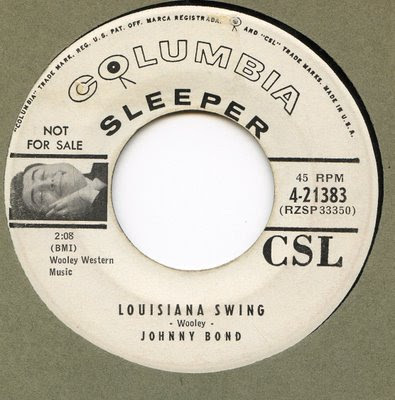 I remember asking around at the various record shows a few years back...and nobody knew what "CSL" stood for. http://www.geocities.com/Heartland/Hills/5876/cd6/comments.htm (and look about halfway down the page). So the "CSL" notation was to tell the deejay that this record conformed to the Columbia Standard Level!! It's amazing what one can find on the 'Web, isn't it? At least in this instance, anyway. It's the original CSL calibrating record! Here's a little bit of it. It's a real toe-tapper, isn't it? 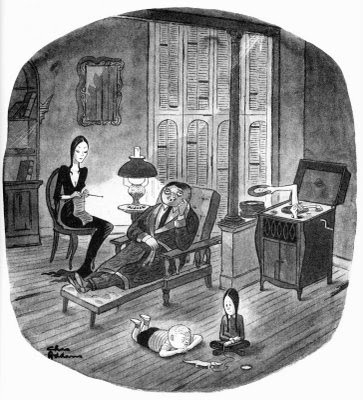 Needless to say, it doesn't get a lot of play at Chateau Zorch. At least the label is interesting. A while back, someone in 78-L remarked that he seemed to recall that the "Hi Fi Plus" logo at the 9:00 position on many promos of the period was the indicator for the deejay that the record conformed to some standard level. often found on covers on LPs that were issued to the public? 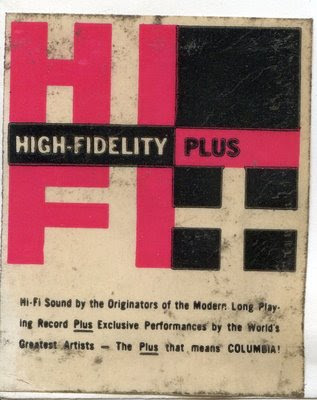 My guess is that "Hi Fi Plus" was Columbia's answer to RCA Victor's "New Orthophonic High Fidelity"
Of course, it was the CSL that the 78-Ler was thinking of. Since both the CSL and Hi-Fi Plus were first used at around the same time, it's understandable that there was a little confusion...and it's been over half a century since most people have given these matters any serious thought. In February, I mentioned all of the recording activity that followed the first From Spirituals to Swing concert in December 1938. ARC/Vocalion recorded Mitchell's Christian Singers, Sonny Terry, and the three boogie-woogie pianists, Albert Ammons, Pete Johnson and Meade Lux Lewis. Shortly thereafter, the three pianists recorded for Blue Note....the first sessions for this new label. From what I've heard, Alfred Lion had fifty copies each pressed of the first two records. He wasn't sure how well they'd sell. They sold quickly enough for him to continue pressing the rest of the sides and do more recording as well. 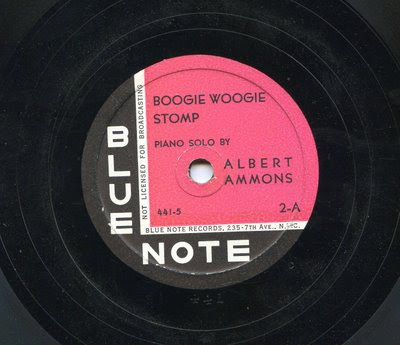 NYC, 6 January 1939: Albert Ammons, piano solos. Great sides, aren't they? One can see why they sold fairly quickly. But all subsequent pressings used the more familiar blue-and-white label (and for a while, Blue Note used a blue-on-yellow color scheme too). Psssssst....want this rarity? I'm thinking of selling it. Money's a little tighter than usual, and I'm feeling the pinch. A copy of this record sold a few months ago on eBay for close to $1,000.00. I'd be a happy Zorch indeed if my copy earned almost as much. But do I sell it on eBay, send it to a certain well-known 78 dealer, or conduct a private sale? 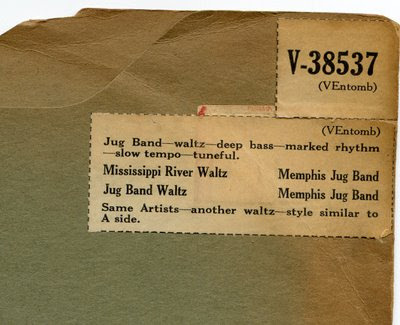 Here's another record I think I'll put on the block...what is probably the only time you'll hear a jug band doing...waltzes! Strange as that may seem, it proves how versatile Will Shade's group could be...they could (and did) play posh social functions, even if they had to come in through the back door to do so. It's a pleasant record, but one that leaves some collectors flat...I got this from a big Boston-area record dealer who really didn't like it much at all. I traded a Miles Davis Prestige LP for it (shoot...the Miles would go for a pretty penny nowadays too!). And, yes...this is also up for grabs. I have it on CD. As I said, it's pleasant and historically interesting, but it's never been a huge favorite here (if it was something else by the MJB I'd probably keep it). In the past three years or so, I have seen two or three copies of this record go for between $500-975, depending on which way the wind blew that week. Oh, did I mention that my copy has its original dealer's sleeve? Or, rather, a sleeve with the original dealer's sticker on it? These stickers would be put on any heavy paper sleeve...one that would temporarily house a certain record. Most of the time, the sleeve would be used several times over (notice that this sticker is on top of another one). 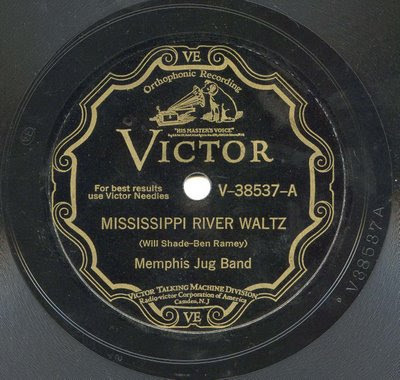 Memphis 15 September 1929: Will Shade, harmonica; Ben Ramey, kazoo; Charlie Burse, Vol Stevens, guitars; Jab Jones, jug. You might ask why I left the pre-music noise in...there's a tiny, almost imperceptable pressure crack that goes in about 7 or 8 grooves...and I wanted to prove to the record-buying public that the crack is inaudible. The thumping noise that is audible at the beginning is only the bit of nail polish I put on the crack [in the lead-in only, of course] to 1) make sure the crack wouldn't get worse, and 2) to locate the crack in the first place...it's so small it's almost invisible. In the 25 or so years I've had the record, it's never gotten any worse, and it's unlikely to do so in the future. Something unusual...the same title, the same label...but completely different compositions! The first version of White Heat is a lesser song from The Band Wagon, sung here (and on stage) by some cat named Austerlitz. I heard he could dance a little too. NYC 28 September 1931: Leo Reisman, conductor; large society orchestra; Fred Astaire, vocal. NYC 26 January 1934: Lunceford, conductor; Eddie Tompkins, Tommy Stevenson, Sy Oliver, trumpets; Henry Wells, Russell Bowles, trombones; Willie Smith, Joe Thomas, Earl Carruthers, reeds; Edwin Wilcox; piano; Al Norris, guitar; Moses Allen, tuba; Jimmy Crawford, drums. Here's another pair of sides that share the same title...this time you can't get much more different...one's a 1920s (oh, all right...it's 1930!) classic jazz piece, the other a mid-1950s country number. 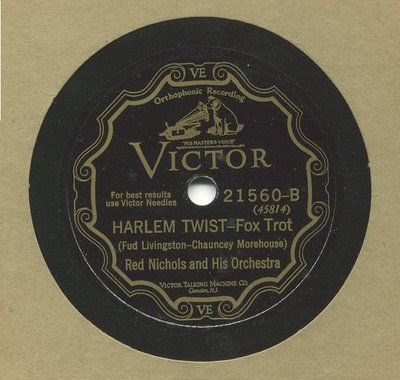 NYC 29 May 1930: Henry "Red" Allen, Otis Johnson, trumpets; J. C. Higginbotham, trombone; Albert Nicholas, Charlie Holmes, Teddy Hill, reeds; Louis Russell, piano & conductor; Will Johnson, guitar; Pops Foster, bass; Paul Barbarin, drums. mid 1954(? ): Johnny Bond, vocal, unknown band. This is the only time I've seen a CSL promo with black print. Then again, I've never seen the "Sleeper" notation or a photo on a Columbia 45 either.